Faxing is not as popular as it used to be nowadays, but lots of businesses rely on it even in modern times. 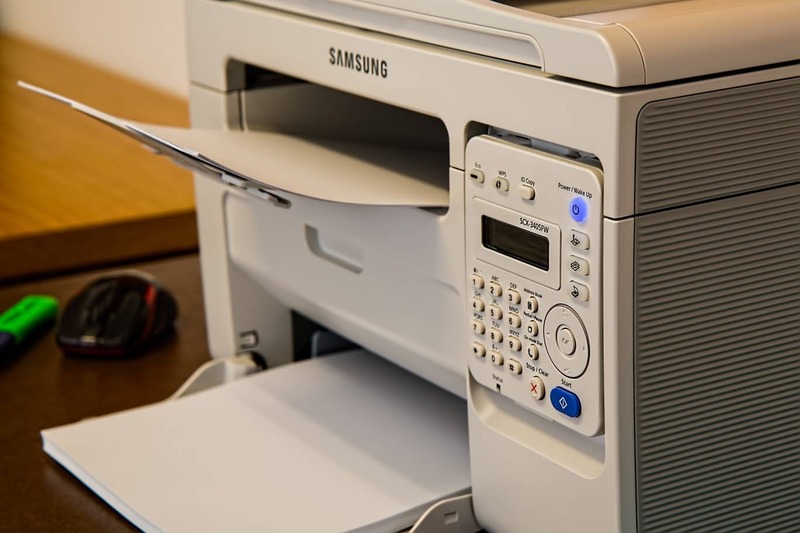 Surprisingly, there are still some situations where you can find faxing necessary. Whether you’re an individual or a business, there are some faxing services available online. You might also be interested in our article about the Best Free PDF Editors. These can be more convenient to use, especially since they’re free and you don’t need to purchase a bulky fax machine. It’s safe to say that almost all such services also incorporate paid models. That’s basically the catch. Still, if you’re fine with some limitations like only being able to send a certain number of faxes per day, then you should take a look at free fax services. The basic concept of such a service is that you provide the PDF files or DOCX documents using your computer. Just send them the text and they will handle all the rest. The following reviews are for the most generous free fax services to consider. They too have some limitations, but you can easily decide which one works best for your needs. It’s not like you plan on sending faxes very often so these services can be really handy. By far one of the most appreciated free fax service around is GotFreeFax. It keeps things simple without cluttering your page with ads or adding an unneeded branding to the fax. Whether you reside in the U.S. or Canada, this service has you covered. In terms of limitations, you can only send a maximum of three pages per fax which is kind of reasonable. There’s also a restriction regarding the number of free faxes you can send in a single day. For more than two you need to start paying. Unless you have commercial-level needs, you should be fine even with these limitations. There’s a decent amount of customization available for this service enabling users to obtain professional-looking end products. Besides PDFs, you can also send JPG files. GotFreeFax manages to do well when it comes to the user interface as the website feels intuitive with clear options to select. Overall, GotFreeFax is one of the best fax services you can use for free. It’s convenient for those occasional times when sending faxes is still required. Their premium pay-per-fax service is probably better as it also relies on extra protective measures such as an encrypted connection. That could be important for small businesses, but for regular users, the free version works well enough. FaxZero is another solid candidate to take into account if you’re searching for a free fax service. It offers a basic, but an extremely useful set of features allowing you to send faxes at no cost. Another strong point is the way it works beyond just the US and Canada as it also supports certain international destinations. Entering the text that needs to be faxed is done with ease and there’s even a decent amount of formatting features. If you prefer, you can more conveniently upload your own documents such as Word or PDF files. Like similar free services, FaxZero will send your document with their branding unless you pay a fee. It’s found on the cover page and it shouldn’t be an issue for most people. Other limitations to keep in mind are the 5 faxes per day with each faxes containing only up to 3 pages. These are fairly reasonable restrictions in the world of free fax services. For those who need to send bigger faxes, beyond those three pages allowed, the only option is to pay. Another thing to mention regarding FaxZero is that after sending the fax you’ll get a confirmation email. The system attempts to send your fax multiple times and will alert you whether it managed a successful send or if it failed after 5 tries. All in all, FaxZero is a solid free fax service delivering legible and crisps documents in multiple file formats. It’s recommended when there’s an emergency and you really need to send a fax quickly without bothering with any fees. It can’t compare to more professional paid services, but for its purpose, this free service represents a satisfying choice. One free fax service that used to be a lot greater than it is right now is MyFax. They had a permanent free version that recently turned to a free trial. That’s a bit of a disadvantage as it will eventually force you to pay. Despite that, it’s a good free fax service to try so it makes this list with ease. A particular advantage of this fax service over its competitors is that it’s more versatile. It comes with support for a vast range of file types including Excel and PowerPoint among many others. There’s also an increased amount of countries you can send your faxes to with over 40 countries accepted. To make things easier when you’re on the go, this fax service offers a mobile app available for both Android and iOS users. All the great features of MyFax can be used for a month after which you’ll need to pay a monthly fee. It’s clearly designed to appeal more to businesses, so for personal use, they’re recommended only if you need to send a quick fax. If you want to try a very capable free fax service another option worth trying is FaxBetter. Although certain features work in trial mode, it still offers the ability to receive lots of faxes per month. You only need to make sure to receive at least a fax a week to maintain the dedicated free fax number provided by the service. When it comes to storage, this service is designed to let you store a maximum of 1000 pages on its website. You can access your faxes anytime. Other great features which unfortunately can’t be used for more than 30 days are the OCR and fax-to-email. Overall, FaxBetter Free deserves a spot on this list as it represents a very convenient fax service to try. It’s up to you to decide if it would be a suitable match. Remember that you will pretty much be required to receive faxes regularly so if that’s not really the case for you, other options will probably work better. A premium account is not very expensive, but it may not be worth it unless you have commercial-grade needs. 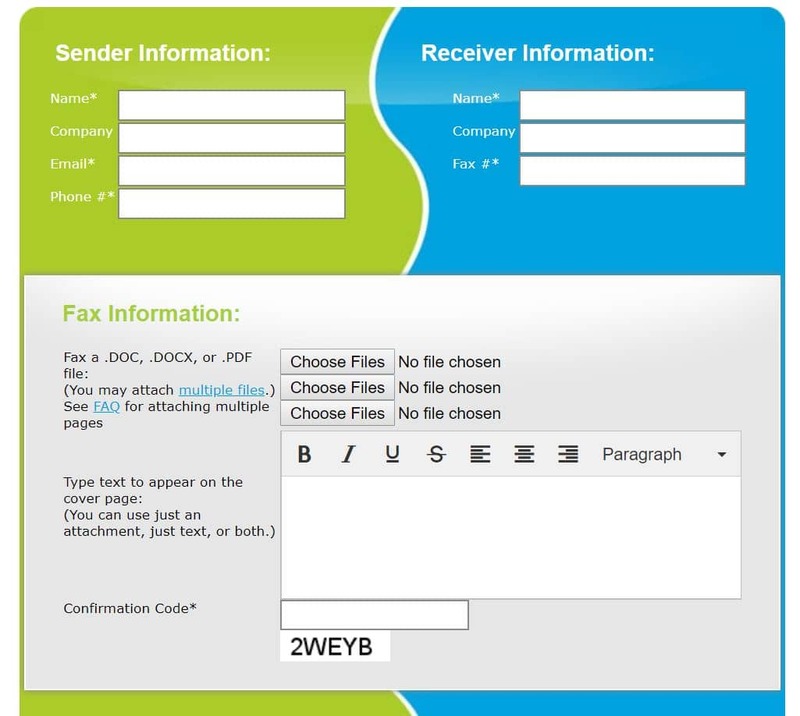 The free plan from eFax gives you many benefits to send and receive faxes online at no cost. You will be required to use their document viewing software and obviously certain limitations are in place, but personal needs can definitely be covered without too much hassle with this service. The per-month limit regarding the incoming faxes is ten which is reasonable for users without high demands. There’s a free fax number offered by the service and if you plan on sending or receiving more than the restriction, you have to upgrade to a paid plan. The premium service is quite expensive compared to others. You basically need to buy an annual subscription to see a more reasonable cost. eFax has been in the business for quite a long time and it deserves a mention considering the decent free package of features it provides. It’s destined more for business users considering the extra abilities it places at your disposal if you purchase a subscription. Anyone who needs a quick solution for sending and receiving faxes for free shouldn’t miss trying out this service. 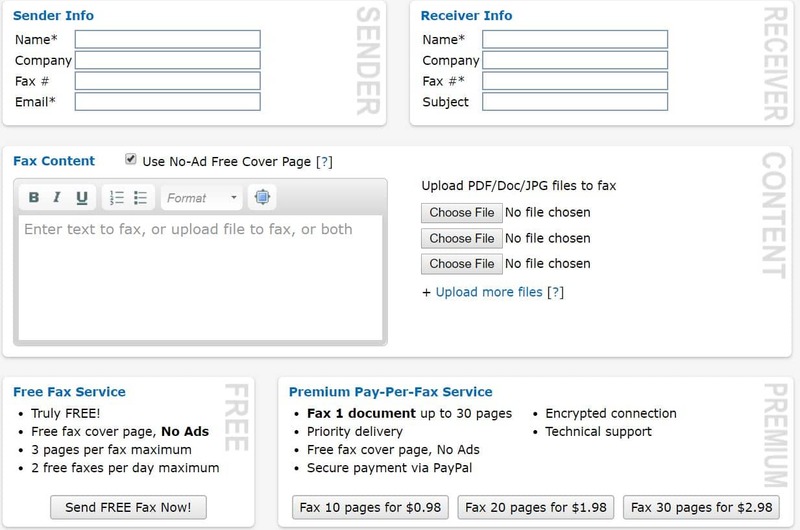 The last fax service that comes with some features for free users is PamFax. It stands out through its built-in support for Google Docs and Dropbox. Up to 3 free fax pages can be managed by a free user which is not surprising for a free service of this type. Those who decide to take the next step and start paying for the service will receive a unique personal fax number. In terms of availability, the service can work from both Windows PCs and Mac computers as well as various Android, iOS, and Blackberry smartphones. Interestingly, you can use it with Skype too. There’s not much else to say about PamFax. It provides a fairly intuitive, well-designed interface and the limitations are quite average for a free fax service. It can be said that’s worth a shot if you need a quick fix to send your faxes online for free. Thanks for the wonderful guide!